This Web Page was set up to document a Barber Half Collection that was started in August of 1987. 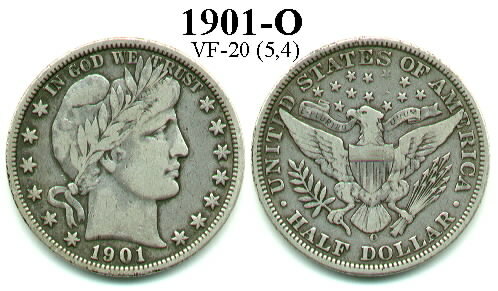 The first half purchased was a VF 1901-O at the 87 ANA Convention in Atlanta. The reason I bought it was, it was priced as a Fine and graded VF. I figured I could use it to trade with, or possibly sell for a small profit, as I was working on an EF-AU Indian Cent Set at the time. 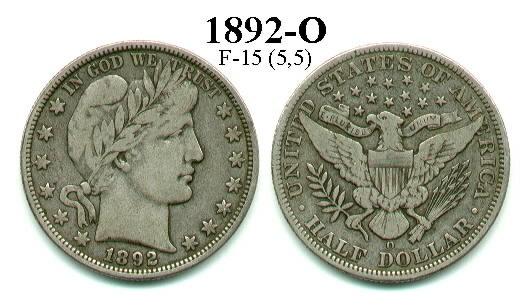 Later as several friends and myself were admiring our purchases the 1901-O Half came into discussion. It was perfect in every respect - it was completely original, had a nice natural antique silver color, and had no marks or problems of any kind. 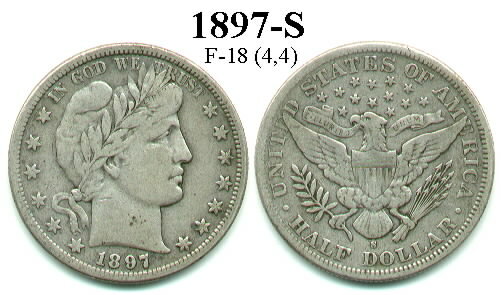 The comment was made by one of my friends, that they wondered how long it would take to complete a matched set of VF halves as nice as the 1901-O. A small disagreement followed. One thought Barber Halves were common and the set could be finished in less than a year, another thought maybe 3-4 years. 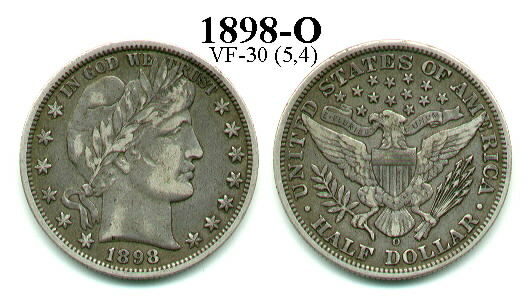 It was this discussion that lite the fire and started the quest which would not be completed untill Aug. of 1998, when the final coin a VF 1893-O was purchased at the BRNA Convention in Dalton Georgia. 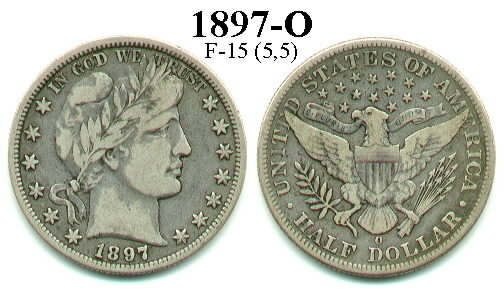 Early into the set it was obvious that original problem free Barber Halves were extremely hard to find. So I decided to expand it to a F - VF set. 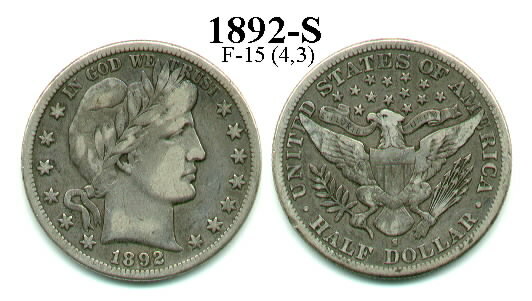 This page was set up to display some of the coins from that set, and for the viewing pleasure of other Barber Collectors. I've also developed a numerical way to rate a Barber Half for eye appeal - which is short and simple to use. This was needed when upgrading coins. For example: as most everyone does, I would carry a check list of the coins I had - showing date, mint, and grade. But, I also needed to know how nice the coin was. If you have say a 1904-S in grade F-12 and you run across a F-15 at a show do you upgrade? Normally yes, but what if the F-12 is absolutely perfect and the F-15 has a very minor rim bump- then I would stay with the F-12. Since carrying your collection with you to shows is not practical, and once you have a number of coins in your collection you can't remember what each one looks like. You need a way to quantify EYE APPEAL. So I developed what I call my "Circulated State / Eye Appeal System". The first link below will take you to a chart which I think will be self explanatory. I have found this to be a very usefull tool, and since you can apply it to any coin series, I would like to share it with my fellow collectors. I hope you will find it as useful as I do. My goal is to eventually have the entire collection online to veiw. On the left are the first coins, I will be adding coins as time permits, check back from time to time. 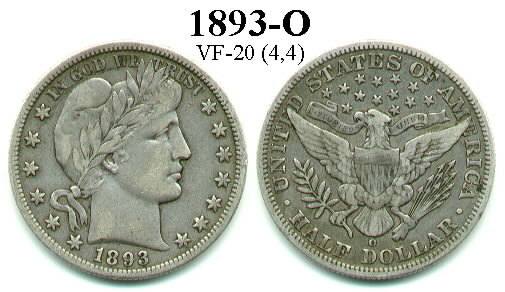 I would be interested in hearing from anyone who collects Barber Halves, especially trying to put a F-VF set together. If you have an interest in any Barber series, or any comments, or questions, please send Email to rwlaholder@aol.com or write to: Randy Holder, P.O. Box 1060, Lake City, TN 37769. MY WEB COIN STORE - RPHOLDER RARE COINS: Hundreds of coins for sale, many with images. 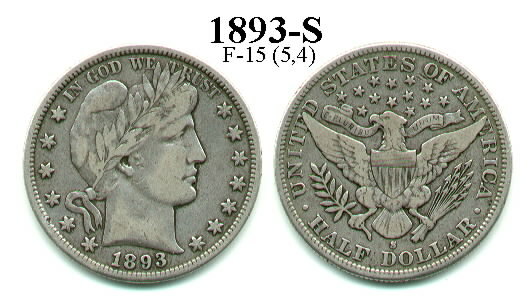 MY EBAY AUCTION SITE: Coin Auctions with Images. This page has been visited by fellow Barber enthusiasts a total of times since being set up in Sept. of 1998.